ACE Layout is one of the four auto-layout options you can use when starting a project or editing a page in Layout or Cover View. ACE generates page designs differently to Template and Quickbooks layouts, ACE Layouts are not predefined and photos or text will never overlap each other. The software analyses the content on your existing page including the number of photos and placeholders, then generates alternative layouts. ACE layouts can be accessed in Layout View or Cover View via the Layouts button in the Contents Panel menu then clicking the ACE icon from the Layouts sub menu. They can also be selected in the Layout Wizard when you start a new project. When ACE layouts are generated, they will include the same number of photos or placeholders that already existed on the page, just as it will keep all the existing backgrounds, frames and rotation settings, it will just rearrange them. However, both ACE and Template Layouts will ignore any text or embellishments on a page. Furthermore Templates will alter and adjust existing settings in a page design. 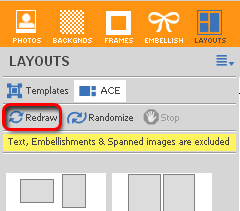 If you don't like the design created, simply click the Redraw or Randomize buttons and the software will endlessly generate more ACE Layouts and an infinite number of great page designs. 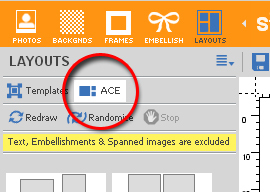 Clicking on the ACE button will automatically give you a number of layouts to chose from, but if you do not like the current selection you can click on the Redraw button. If you like the choice of size and shape the ACE Layout has given you, however are unsure of the layout, clicking Randomize will rearrange the the photos within each of the layouts provided. Once you have a layout you like, simply click on it and drag it onto the page. Click on the ACE tab at the top of the panels area (the left portion) of the screen. Some layouts will be automatically drawn for you. If none of the generated layouts appeal to you, click the button, and Momento will create several more. If you would like Momento to also vary the relative sizes of the photos on the page, click the button. When you see a layout that you may like, double-click on it to see how it looks on the page. If you would like the photos on your page laid out in regular rows and columns (in a grid format), click the Grid button. All photos will be laid out with the same size, in such a way to make the best use of the available page area. If you choose an ACE Layout that you\'re not entirely happy with, it is easy to make changes to it. Repeat steps 3-5 until you are happy with the chosen layout.